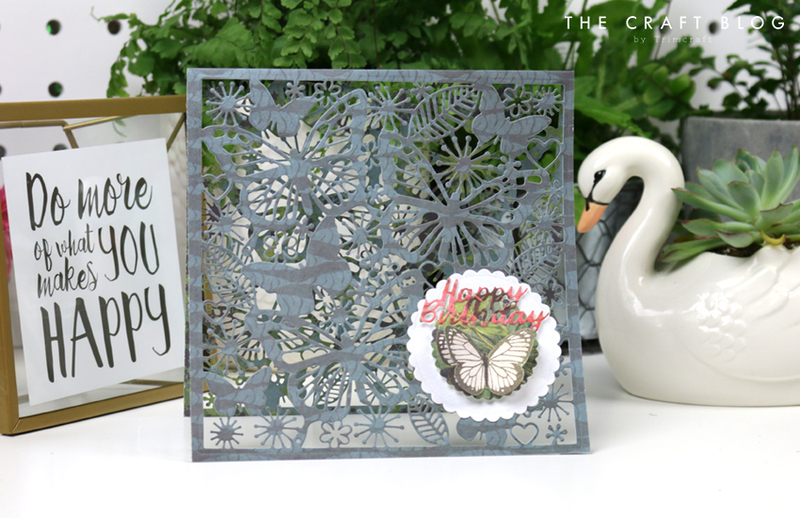 First Edition Craft a Card dies are a very quick and easy way to create stunning cards. But they’re also really versatile and can be used for home décor, layered up on larger cards or used in different ways and embellished, as we have done here. Read on to find out how to create your own intricate, delicate card design that anyone would be delighted to receive! 1. Trim a piece of green double sided 12” x 12” paper in half to measure 12 inches by 6 inches. Fold in half to create a top-fold card blank. 2. Place the First Edition Craft a Card die on top of the card and run through the die cutting machine. For intricate dies such as this, it can help to pass the plates back and forth and also turning the plates over and cutting a second time – being careful not to move the paper or die at all. 3. Repeat the die cutting process on the other side of the card so that you have cut both the front and back of the card. 4. Cut a 2.5 inch scalloped circle from the back of one of the beautiful, pearlescent effect papers and another the same size from white card stock. 5. Cut a 1.45” scalloped circle from the pearlescent butterfly design from the paper pad making sure the circle is over one of the white butterflies. Fussy cut a white butterfly from the same paper. 6. Fix the pearlescent circle to the front of the card in the bottom right corner and fix the white card onto the reverse. This will be where you will write your message on the card. 7. Fix the butterfly circle on top of the pearlescent circle on the front of the card and top with the fussy cut butterfly, using adhesive in the centre only so that the wings can be folded back. 8. Finish with a Happy Birthday sentiment, cut from the red floral paper design, making sure your die sits over the petals when passing through the die cutting machine. Fix above the butterfly on the nesting scalloped circles. We hope that this tutorial has inspired you to create your own Craft a Card design! We’d love to know if you give this a try, so don’t forget to tag @kathycraftstv and to #Trimcraft when uploading to social media and to share you projects in the Inspiration area.